Home>>About Hunt Engineering>>Why work with us? By designing our systems around the concept of highly functional "Building blocks" we can offer systems that have whatever combination of fast I/O and powerful processing you need for your system. It allows us to spread the cost of development across multiple customers so you can get a custom system that is made from COTS modules but you don't have to pay for custom development. You also gain from the flexibility of such a concept so you can change your system design as you go along. Many of the functional "Building blocks" we can offer you incorporate a programmable device such as an FPGA (Virtex-II, Virtex-II Pro, Virtex-4) or C6000 processor (2400 MIPS). This allows you to customise the system to perform exactly the function that you want. You can benefit from a COTS hardware solution that you can program with your special ideas to end up with a unique solution without having to fund custom hardware development. You also gain from the way that you can upgrade your system algorithms at a later time. Sometimes it seems better to build your system around a standard like a PC, or PMC modules. However these things have not been designed for Real Time operation. HERON and HEART have been specifically designed for high performance real time applications. You can guarantee real time performance at 400Mbytes/second! They do not use industry standards because none exist that can provide the uncompromising performance of HERON and HEART. Apart from HERON and HEART the FPGA, DSP and I/O Technology we use is often a good reason to choose our solution. Our systems are suitable for any application. Whether it is a DSP system, a data acquisition system, or an ASIC simulation system, our modular systems are ideal for low volume projects and those requiring a high degree of flexibility - you can configure the custom system you need from our commercial off-the-shelf (COTS) modules. HERON systems are also the sensible choice for medium volume projects - the fact that we have done all the hardware development and testing for you means that there is no NRE involved in the project costs. We are not experts in any of our customers' application fields, our expertise is in real-time FPGA and DSP hardware. We can discuss the needs of your system with you and recommend the best configuration, or the choices that you have. If our hardware cannot fulfil your requirements, we'll tell you - we don't make promises that we can't keep! Contact us today! We have extended the industry standard development tools to make writing and testing the program for your system as easy as possible. We provide a variety of software frameworks, APIs, plug-ins and example projects to help you program your system. To get you started on your application as quickly as possible, we provide a comprehensive range of tutorials and software examples of how to use your system together with detailed product manuals and introductory movies, all on CD. 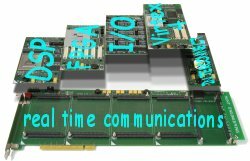 You can be sure that new technology will emerge whether a larger/faster FPGA/DSP or a new I/O standard. HUNT ENGINEERING is committed to manufacturing HERON modules for real time systems, so you can be sure to see any new technologies being included in the range. From our history you can see that the way that we will introduce any new technologies will be in a way that's compatible with what you buy today. This means that by choosing HERON and HEART now you can expect painless tracking of future technologies. We've been around since 1988, many of our customers have been us with us for that long, and we aim to continue designing and supplying the best in real-time modular DSP. So now take a look at the Systems we can offer.